I don’t know about you, but it’s been go go go on my end these days. Spring. It’s like that. Lately, I’ve been leaning heavy on recipes that take up very little time in the kitchen and easily transform into lovely leftovers in a cinch. This is that. 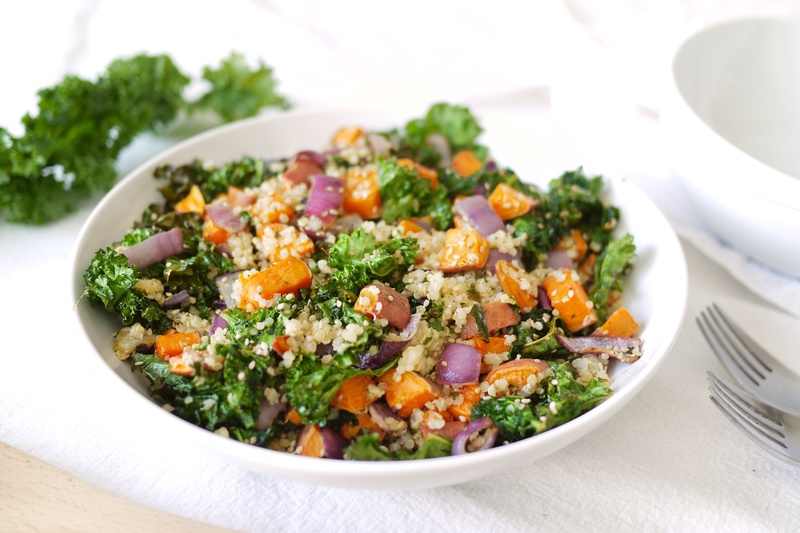 So, as I’ve been excitedly thumbing from Joy McCarthy’s latest book: Joyous Detox, I just knew I had to try this recipe for the Warm Sweet Potato Kale Bowl with Quinoa. It features some of my favourite ingredients, includes minimal prep time and was too scrumptious looking to pass up. Plus, it’s warm! I love a warm salad. 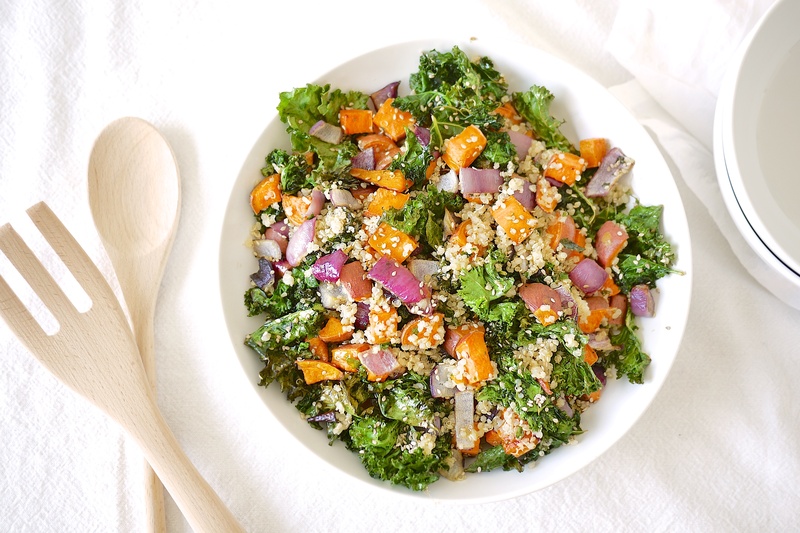 Kale is just so damn versatile. You can literally do anything with it, including baking the leaves until they get slightly crispy as she calls for here. If you want to go all out, go ahead and bake ‘em a bit longer and transform them into actual kale chips (some for now and some for later!). 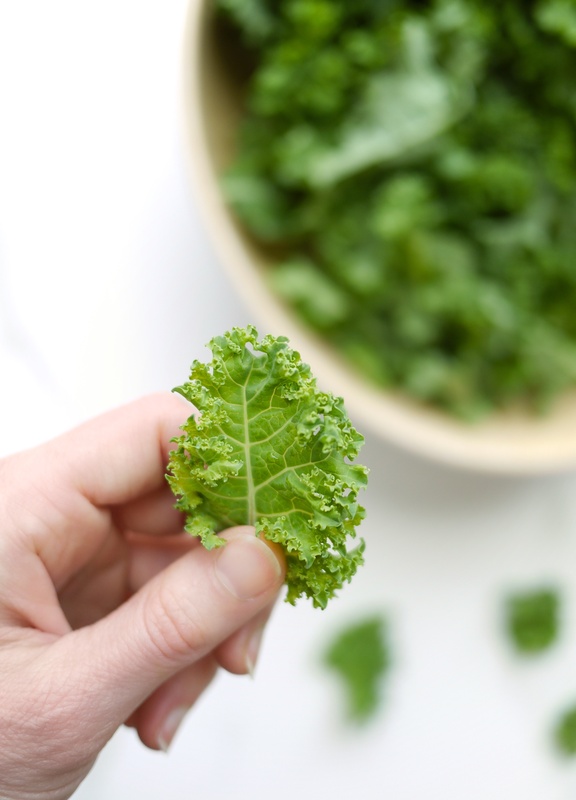 Oh, Kale. 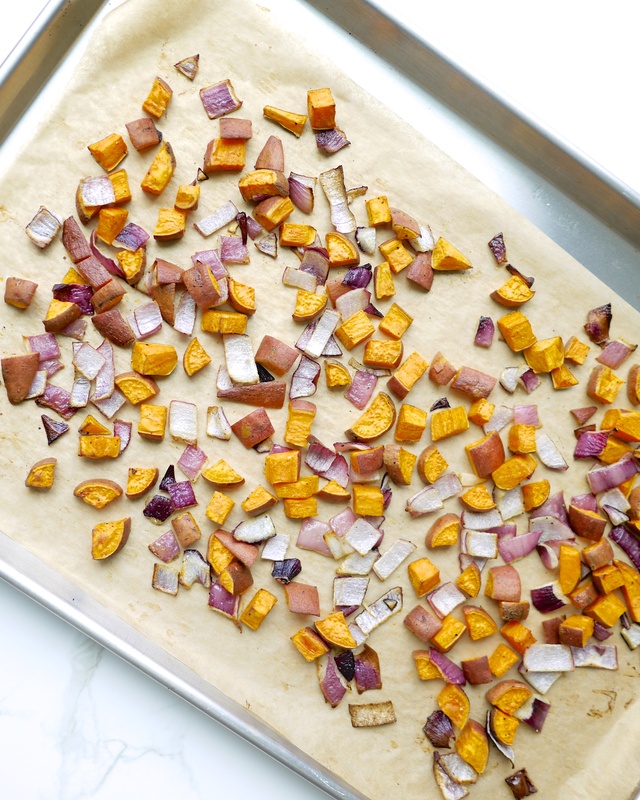 I love the base of roasted sweet potatoes and red onion – both teaming with antioxidants. And, as a general rule, it’s always great to have a bit of roasted veggies around. You can go a head and make extras of the sweet potato and onion bit and store the rest on the fridge for later on. They make a great snack on their own and easily fit into any other meal you might be making through the week. You’ll be getting lots of beta carotene, vitamin C, potassium and fibre. I know you like that. As an added bonus, this recipe reignited my love affair with balsamic vinegar! I’ve been so focused on my go-tos like apple cider vinegar and lemons and limes that I’ve all but forgotten about this wonderful, sweet and rich flavour addition. It really makes this salad sing and I’ll be thinking of other ways to add it to my dishes from now on. This comforting, fresh-tasting salad makes a perfect meal or side dish and is easily reheated in a frying pan or eaten cold when you decide to dip back into it though the week. Bake for 25-35 minutes, until the potatoes are fork-tender. Return sweet potatoes and onions to bowl. 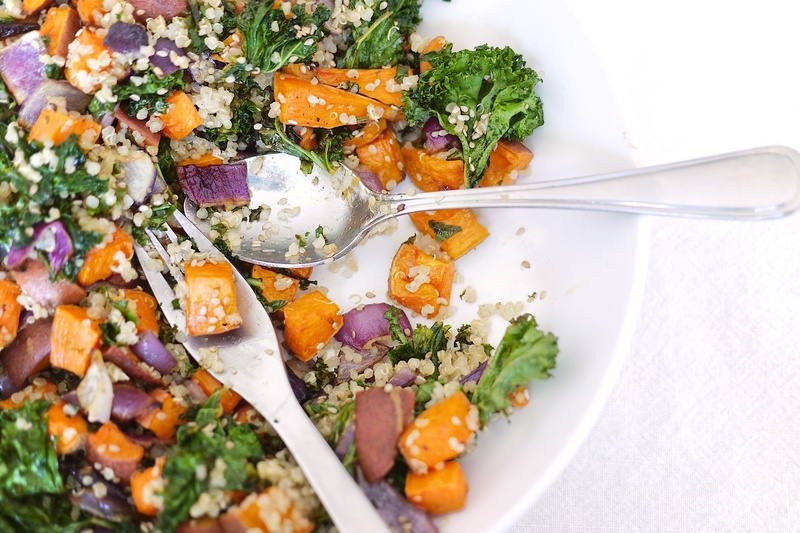 Add kale and quinoa to sweet potatoes and mix together. Drizzle with olive oil, season with salt and pepper and sprinkle with sesame seeds. I love Joy’s tip, in the book, about subbing quinoa for hemp seeds too. Spot on! 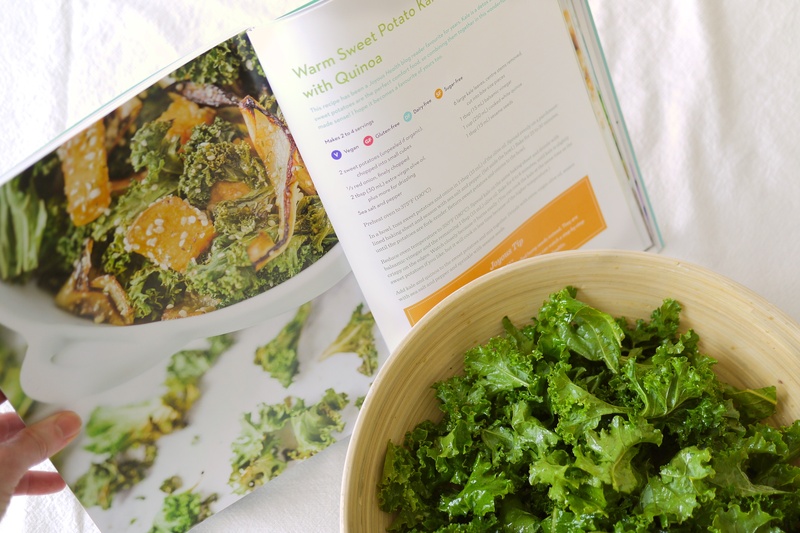 One lucky winner will be scooping up a copy of Joyous Detox for themselves! Hop on over to my instagram post to enter this exciting giveaway! 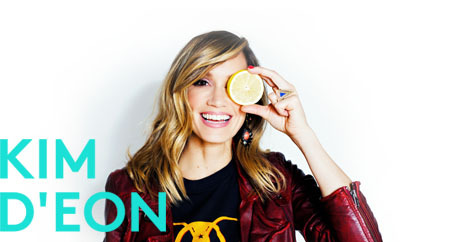 For lots more tasty, healthy and easy meal ideas and detox tips, head over to www.joyoushealth.com to have a boo at her new, beautiful book! Make sure to tag me on instagram @kimdeoncom if you make this so I can see how it turned out for you!